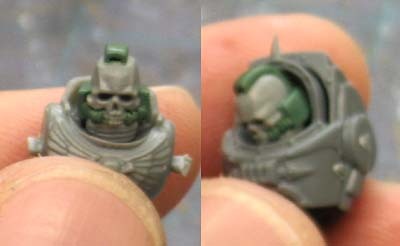 A long time ago, I posted about how I made a Chaplain "skull helmet" for power armoured Chaplains. This of course spawned the idea of how to do the same thing for Terminator armoured Chaplains. Unfortunately, the same helmet could not be used for both types of armour. Just my luck. Here's the proof. The power armoured version doesn't sit in the neck cavity like it should/does in a power armoured neck. There are a couple of reasons for this, but I'll save you the discussion and just show you what changes need to be made to the original process. 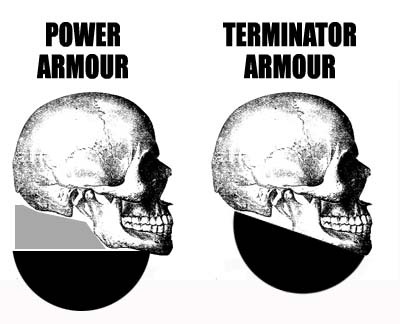 The complete conversion process for the power armoured skull helmet is here. In the power armoured version, the neck piece sits level with the bottom of the jaw and it's slightly set back from the front of the jaw as well. In the Terminator version, you'll need to angle the bottom of the skull jaw slightly and mount the neck piece at that angle. It can be set back slightly, but not as much as you would if you were doing power armour. The best thing to do is take both pieces (the neck portion and the skull), set the neck piece into the Terminator neck cavity and get it in position and then glue the skull in place like that. Then you're sure to get the best position possible. You can see the skull sits in the neck cavity much, much better this way. There are two things you need to make sure you do when adding your side and top pieces (if you choose to do so). 1. Trim ALL the excess off the back of the head. 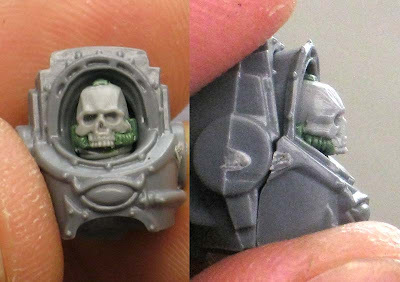 The clearance behind the head is next to nothing and if you add anything back there or on top for that matter, you'll prevent the skull from sitting in there properly. 2. Keep them low profile. You're working in a small area overall, you can't go crazy with huge vents that wrap around the sides of the skull. I added both the top vent and the sides but tapered them into nothing as they came around the side of the skull. This fills out the skull and gives it the look I like most. And that's it, a few minor adjustments and you can build a skull helmet for your Chaplain regardless of what armour he's in. That's a great looking conversion mate. Really well done! Thanks. It doesn't take much to pull this one off, but there's a few thigns worth noting before trying to do it and that was the purpose here. I might have to 'borrow' the idea for some of my 'dead termies' on my reaver base..
Great conversion of course. 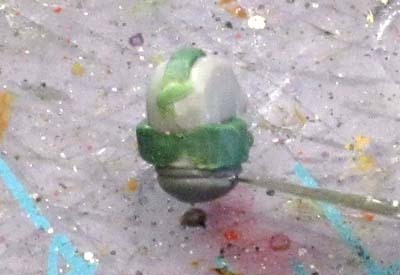 Your work gets me itching to mix the greenstuff. Inventive graphic too..! What do you think of the PA one I did a while back?? I got the tactical squad bald sergeant head, cut his face off and then cut a skull in half to "face on" and then used a second skull to make a jaw. Nice conversion work. Looks great and is very fitting. MC Tic Tac: Looks good, it's a different look to this one, but doesn't appear to be much more work in the end if my guessing correctly. I like that the face includes the bottom of the jaw too. This is a really nice and cleaver helmet conversion. I'm going to have to bookmark this for future use.